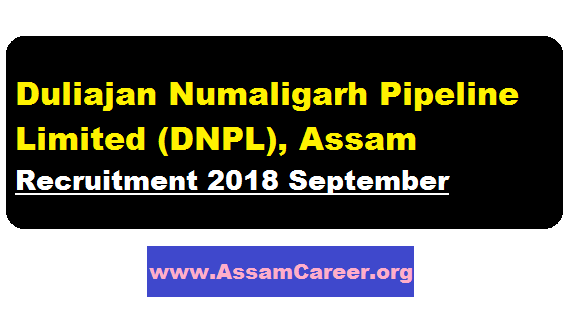 Duliajan Numaligarh Pipeline Limited (DNPL), Assam Recruitment 2018 September :- Duliajan Numaligarh Pipeline Limited (DNPL), Assam has published a recruitment notification in the month of September 2018. According to the DNPL Duliajan Assam Recruitment 2018, Duliajan Numaligarh Pipeline Limited invites applications for filling up the position of Managing Director & one General Manager in Duliajan Numaligarh Pipeline Limited (DNPL), Duliajan, Assam. The details of the vacancy can be found below. In this section, we will discuss in details about the recruitment of Various Posts under DNPL Assam Recruitment 2018 September with vacancy details, eligibility criteria, salary with other details and requirement. JOB DESCRIPTION AND RESPONSIBILITIES : The Managing Director is the Chief Executive of the Corporation and accountable to its Board of Directors and Government of Assam. He is responsible for the efficient functioning of the Corporation and for achieving its corporate objectives and performance parameters. a) AGE :- Minimum age of the applicant should not less than 50 years and maximum age should not exceed 57 years for outside candidates and 58 years for internal candidates as on 1st January, 2018. The age of superannuation is 60 years. >> An officer of a Central Public Sector Enterprise (CPSE) or State Public Sector Enterprise or Autonomous Organisation. >> An officer of the State Government or Central Government. >> An officer in a Reputed Private Sector/Multinational Company. c) QUALIFICATION : The incumbent should be Engineering Graduate /CA/ICWA/MBA or equivalent from a recognized University/institution. d) EXPERIENCE :- The incumbent should possess minimum 15 years working experience in a senior position of Deputy General Manager/Chief General Manager/ General Manager, in a Public Sector Under taking/ Autonomous Body/ Reputed Public/ Private Company or equivalent rank in the Central Government or state Government with excellent academic record and proven track record of overseeing the management/production function/ administrative function in a large private/public sector organization in Chemical/petrochemical/mining industries/ or industrial consultancy firm of national repute etc. Candidates having past experience in Petrochemical Industries/Gas & Oil Pipeline transportation will be given preference. e) PAY SCALE : The post carries a fix pay scale of Rs. 55000/- per month (prerevised and likely to be revised shortly. Perks and other allowances shall be admissible as per Company Rules. f) TENURE OF APPOINTMENT :- The appointment shall be initially for a period of 3 years. However, based on assessment of performance by the Board of Directors of the Company and approval of Government, the term may be extended by another two years or upto the date of superannuation, whichever is earlier. JOB DESCRIPTION AND RESPONSIBILITIES : The Position of the General manger is the next to the Managing Director. He is responsible for overall management of the company ensuring implementation of direction and policy decision of the Management relating to the company. He is to supervise/oversee/ manage / administer the affairs and operation of the company in close coordination with various sections/departments of the company and to guide the company to achieve its objectives. a) AGE: Minimum age should not be less than 40 years and maximum age should not exceed 52 years for outside candidates and 55 years for internal candidates as on 1st January, 2018. The age of superannuation is 60 years. b) QUALIFICATION: The incumbent should be an Engineering graduate/ M.Com with MBA or CA/ICWA or equivalent from a recognized University/ Institution. c) EXPERIENCE : The incumbent should possess minimum 10 Years working experience in a senior position as Manager or 5 years experience as Deputy General Manager/Chief General Manager or equivalent in a Public Sector Undertaking/Autonomous Body or Reputed Public/ Private Company with excellent academic record and proven track record of overseeing the management/production function/ administrative function in a large private/public sector organization. Candidates having past working experience in Petrochemical Industries / Gas & Oil transportation will be given preference. d) PAY SCALE :- The post carries a pay Rs. 26000-45000/- under Payband : 5 with Grade pay – Rs 8700/- per month (Pre-revised and likely to be revised shortly). Perks and other allowances shall be admissible as per Company Rules. Intending candidates fulfilling the eligibility criteria may submit their applications duly signed and affixing a passport size photograph through proper channel or with a no objection from the employer along-with full bio-data/C.V, email address, self attested copies of testimonials/certificates, pay slip etc. in a sealed cover, superscribing the post applied for, to the Additional Chief Secretary to the Govt. of Assam, Industries and Commerce Department, Block-D, 2nd Floor, Assam Secretariat, Dispur, Guwahati-6. Last date of receipt of application is 15th October, 2018. Separate applications shall have to be submitted if applied for both the post. The candidates who have already submitted their application in response to earlier advertisement vide no. Janasanyog/D/712/18 need not apply afresh. Candidates appearing the interview shall be reimbursed to and fro economy class airfare by shortest route from the place of residence/place of present posting to the place of interview on production of actual travel documents and receipts.